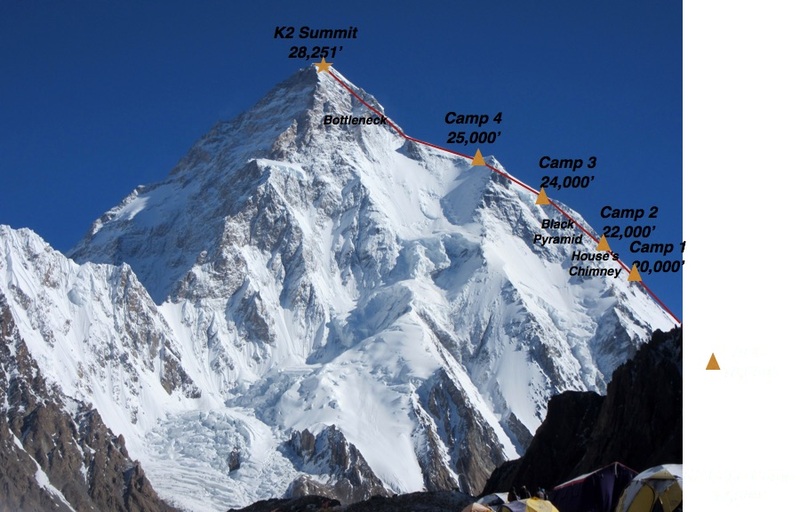 There is progress on K2 but clarification that the two teams are working independently. Locals quit on Nanga and avalanches end Manaslu effort. The winter clock continues to advance. The Kazakhstan, Russia and Kyrgyzstan team is back at K2 Base Camp after a few rotations up the mountain and after almost 7 days of weather delays. They have slept at 6800-meters/22,310-feet the location of traditional Camp 2 on the Abruzzi. We locate all camps in usual places. Except some intermediate camps, while fixing up ropes. C1 and C2 are set well already. We have 5 tents redfox cave, on the route. Ropes enough for the whole route, snow anchors, ice screws, pitons. Food and gas we bring just enough amount for every trip plus little deposit for emergency cases. All garbage is brought down to BC. The other K2 team, lead by Alex Txikon, continue to make plans and build igloos but there are some issues with ice and rock fall taking two members off the mountain by helicopter: Waldemar Kowalewski and Marek Klonowsk. Two people from the Base Camp’s support team (NO mountaineers) have descended from the Base Camp; one of them, for an injury he has had for several days and the other one just to help him. There was no urgency but we decided it just to avoid unnecessary risks. 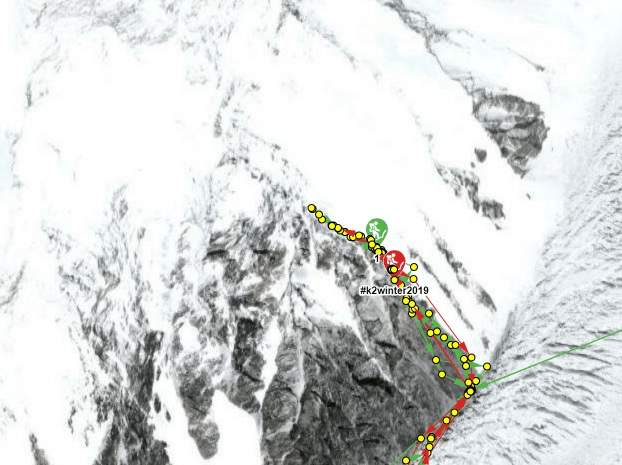 They are making progress now that Txikon finally made a route decision after being on K2 for a couple of weeks – they will take the Abruzzi – same as the other team. He considered the extremely dangerous and once climbed East face. We have equipped up to Camp 2 at 6700 meters in just 2 days. It is a real success and we are very happy. I am very proud of the whole team, we have equipped a new route line. After equipping with 1,100 meters of rope until Camp 1, we have taken another 1,200 meters of rope with us. The weather has been quite good although the strong wind has not helped much. However, we have worked well and we still don’t believe what we have achieved. After exploring the east side of K2 we have made a decision. It is very dangerous and risky, because between 6800 and 7000 meters is very exposed, and then you have to cross the glacier to Bottleneck. In addition, everything from the mountain falls towards that side. Therefore, we will ascend through the Abruzzos route. We have also equipped more than 5800 meters, almost until Camp 1. The team of Daniele Nardi, British Thomas Ballard continue to climb on NB but the two local climbers, Pakistanis Rehmatullah Baig and Karim have left, giving up after too much snow and winds up high. They had established Camp 3 at 5,714m with a cache of gear but upon their return found their tents blown away with no trace. They are attempting the Mummery’s Spur. Finally a good weather window has opened today, and again Karl Gabl was right. Obviously with the sun, the avalanches have increased, they also approached and reached our base camp. Fortunately shortly after this photo a helicopter came to rescue us. Over the last few days the aim of reaching my fifth summit in winter was transformed into surving in this situation! It would take at least 2 to 3 weeks of sunshine to settle 6 meters of powder snow, but the forecast is far from good. Sometimes giving up is an essential ingredient for future success and with this decision I want to honor the nickname “winter maestro” I have been given. Again, When does Winter End? If you remember the K2 attempt last winter, there was a lot of controversy over when winter ends, mostly by Denis Urubko. He feels it ends on February 28, not the Spring equinox on March 20, 2018 at 12:15 pm EDT. It appears this year, teams are taking the long view. The K2 teams are making good progress at the moment but more bad weather is in the forecast – winter after all. NB is not looking promising at the moment. So we will see but the next week or so will be pivotal to see if the climbers can touch 8,000-meters and establish sustainable high camps for a summit push.